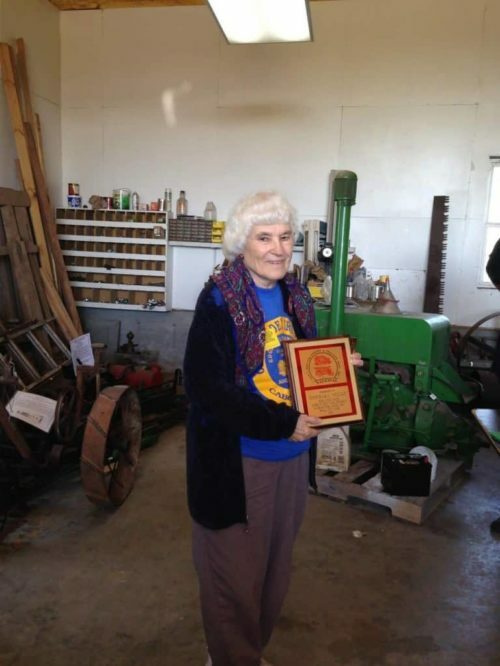 Barbara was and has been a very faithful supporter of Ozarks Older Iron Club (OOIC) and EDGETA since Branch 28 was organized. Her husband is one of the founding members of Branch 28. When they had their first show and tractor pull, Barbara was in charge of the snack shack. She has volunteered all through the years to be in charge of the eat shack (kitchen) and is a very faithful worker. Barbara has been the supervisor of the cook shack for all of Branch 28’s activities since the first show and tractor pull. The first several years she directed other volunteers as they cooked and sold hamburgers, hotdogs, pies, etc. to the persons in attendance. This was all done with folding tables, popup canopies and extension cords for the fryers and cookers. When Branch 28 bought their permanent show grounds and built a building, Barbara was instrumental in the design of the kitchen and serving area. She has consistently worked to upgrade the facilities and equipment in order to develop the cook shack into a very successful profit center for our club. Barbara has been a significant force behind all the work and dedication in EDGETA, Branch 28 throughout the years. Her work ethic and influence has been instrumental in the building and improvements of our cook shack without the officers and board of directors needing to be involved in the day to day operations. She has encouraged other persons to become involved. This has carried over to the younger members as they develop a sense of continuation for helping Branch 28 collect, preserve, and exhibit antique equipment. Barbara’s influence will be very important as following generations work to continue the traditions of our past agricultural methods and equipment.